As I have already mentioned in the previous article about winter in Svaneti, the cultural heritage of the region is incredibly deep and rich. But don’t expect the Belvedere and Tate level of culture there – the Svan masterpieces are carrying something opposite inside. Something very old, wild, pagan… and at the same time, closely connected to the Christianity. If you understand how remote Svaneti is, how tough the local life is, especially in winter, you will be deeply surprised by the level of skillfulness of the frescoes, painting and jewelry made by Svans. Among the Georgians, they are considered to be a bit slow, grumpy and stubborn folks, due to the isolation they used to live in. But most important, due to this strong character and ability to survive, these people preserved a lot of Georgian treasures during the multiple wars Georgia was involved in. I will tell you about three most significant places in Mestia, where you can experience the essence of Svan culture and see the pieces of art created by locals. In Mestia, the old part, which is above the well renovated center, there is an unbelievable church called Laghami. In the city center, there will be signs pointing to it. Also, it will be put on any map that is available in the tourist information center. On the external walls of the church, there is a distinctive pattern that reminds on the official logo of Georgia, and a barely visible fresco of Adam and Eve expelled from Garden of Eden. An elder man, Rezo, is the key keeper. He is an artist and specialist in the restoration of frescoes (even though he has a lot of hard home work to do). If you want to visit the church and not just to see its exterior, I could share the contacts in PM, if the paper on the fence with Rezo’s number is gone. The underground part was built in the VIII century, the upper is a bit younger. There is no precise date of construction, but the frescoes there were created 450-500 years later. Once I was there, I couldn’t believe my eyes: the walls of the upper part didn’t look like XII – XIII century at all, the colours were very bright and saturated. The master has painted not just the saints, but also added some animalistic motifs and put his “signature” above the door – the depiction of mountain goats. Rezo told us that during the last reconstruction session, as they were working on the XII century layers in the lower part of the church, they have also discovered the X century layers that depicted the other saints. So now they consider what to do and how to continue. I have also visited the family tower and museum of Margiani family. Built in the Middle Ages (XII century) as the most of the towers in the region, it was a safe place for the family members during bad times. Please take into consideration that winter house and the tower are the museum that the family maintains as part of the heritage and tourist attraction. So there will be a small entrance fee – I suppose it is 5 lari by the beginning of 2018. In order to get to the roof of the tower, you’ll need to climb up several vertical ladders, floor by floor. The walls are very thick. It’s always cold inside, that’s why it was used for storing food and keeping cattle in the times of peace. As Svans used to have the tradition of blood revenge, they had to use the thick walls to save themselves not only from external enemies, but also from the hostile clans. Though, please note that blood revenge happened only in case of intended crime. Also in the historical house of Margiani family I saw the room for prisoned criminals, too. Dependent on the decision the council of elders would make, the criminals could also pay off to the family they offended with their labour. In general, the house keeps many old items that family preserved for showcasing their cultural heritage. Larisa Margiani is explaining the structure of the house very clearly: in winter, people and cattle used to stay in one space, but used different entrances. The herd was in the heart of the house; the ventilation system worked in a tricky way that let the Svans smoke the food for long cold winter, while cooking or warming up the house. There are also a lot of details to be explained, when you look at the coarsely looking furniture. Massive chairs and shelves are covered with skillful carving that depicts solar and animalistic symbols. You can also see the samples of Svan furniture in the fantastic contemporary Museum of History and Ethnography of Svaneti that overlooks Mestia from an opposite hill, but being sincere, there are more interesting items. My favorite halls are those with Bibles from X-XIII centuries and the one with jewelry and armour. Also, the museum often hosts the temporary exhibitions. The one I managed to attend in December 2017 was a photo collection about the traditions of Native Americans. The museum is open six days a week, Monday is a day off. You can visit it from 10 AM to 6 PM. The entrance fee is 5 lari. Those are my favorite cultural places in Mestia. If I travel to Svaneti in summer, I often go to Ushguli (the highest constantly inhabited settlement in Europe), the area protected by UNESCO. On the way, it is possible to stop by Ipari, in another ancient medieval church, or climb the Tower of Love (though I was very disappointed by the fact that in the last couple of years, a lady that doesn’t own the tower started charging the entrance fee). 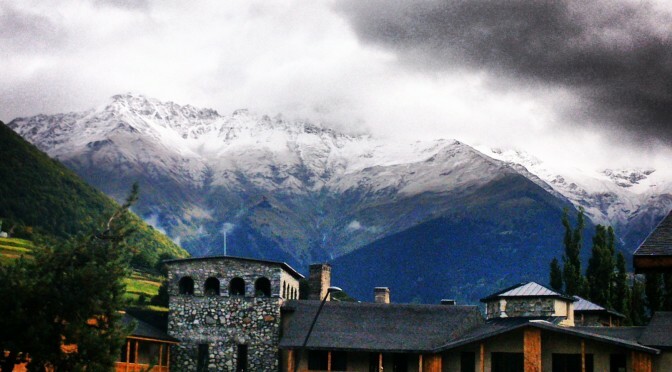 Though, in winter the travelers usually stay closer to Mestia, the most developed area of Svaneti. There are not many other things to do except of hiking or skiing – I also mentioned a couple of bars in the article about living, eating and winter sports facilities in Mestia. Of course, there is a lot of space for infrastructural development, but in my opinion, one travels to (really) remote mountainous region not to find a Disneyland or a vibrant resort with signature cocktails in the trendy bars. So far, Svaneti is still about wandering around marvelous viewpoints and observing indigenous culture.